I have always loved travel. As a Spanish teacher, I thought it important to share my love of travel with my students. So, together with a German teacher colleague from across the hall who shared that belief, we planned a European tour for our students. It was hugely successful, and we resolved to do it again. Over the course of eight years, we actually wound up leading four school-sponsored European student tours together. 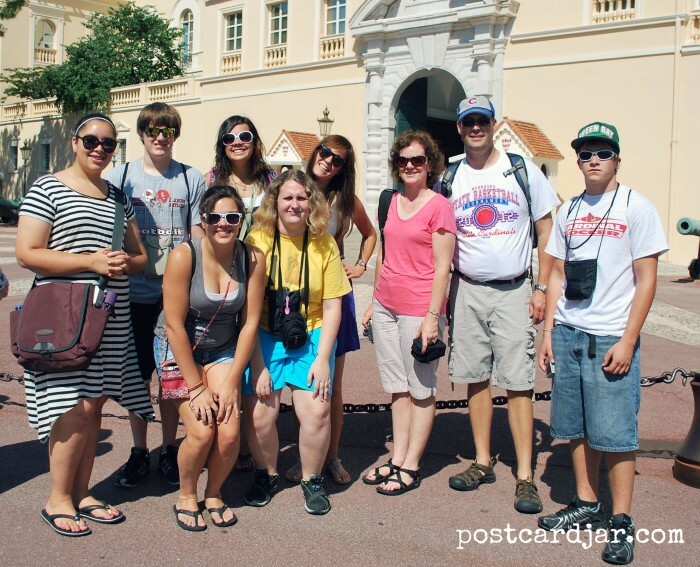 Outside the palace in Monaco on my fourth guided tour with students from the school where I taught Spanish. I can’t say enough about the tours’ educational value for our students. The trips opened eyes, expanded world views, taught history and art appreciation, showed incredible sights, and provided much fun for all participants. But for me, personally, a critical element was missing. On each of those trips, we’d walk past sidewalk cafes and I’d see people sitting in the sun on a beautiful day enjoying foods of their choice and some of the best beers and wines the world has to offer. I, however, was with other people’s teenage children on a tour, and our meals were planned, usually in the back corner of some restaurant’s basement. While the food was good, the menus were set, and it wasn’t appropriate for me, a teacher/school administrator leading students on a school trip to sample the beers or wine. 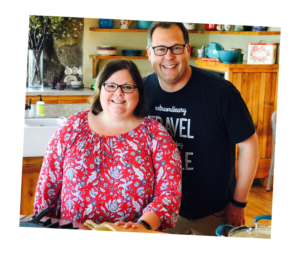 On our trip to Europe last summer, Ann and I went alone with no students by our side. This opened up a world of freedom I’d only dreamed about on those trips with the kids. I eagerly anticipated wandering the streets, looking for that perfect spot in the shade to have a wonderful meal. We found just such a spot our first full day in Rome. 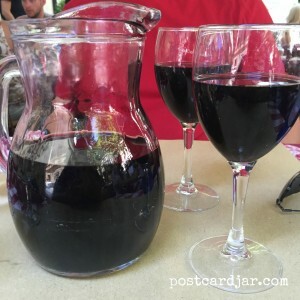 We sat down and savored an amazing pasta lunch and sipped a pitcher of the house wine –some of the best wine we’ve ever had — in a meal that lasted a blissful two or three hours. 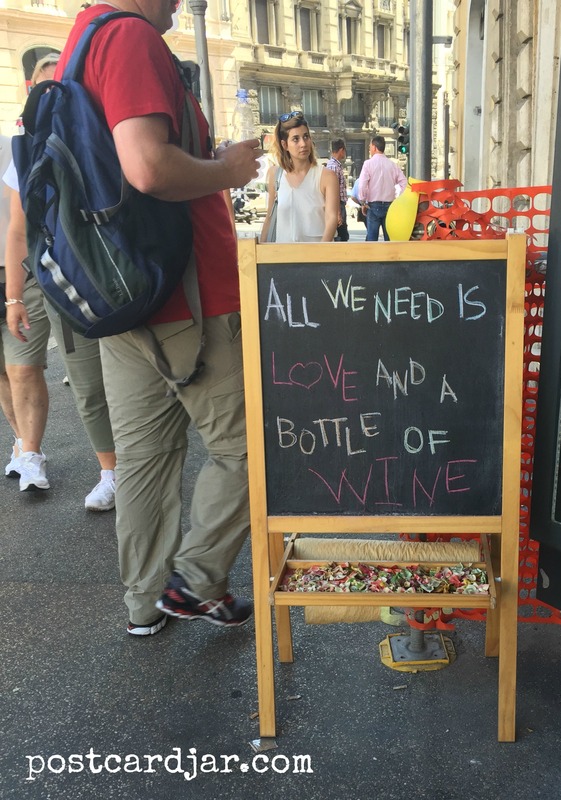 (Let me pause a moment to say that in Italy, France, and Spain the wine is plentiful, wonderful, and cheap. Seriously, I’ve seen bottles of decent wine for less than the cost of a bottle of water.) It was so nice to have the freedom from student travel to pause where we wanted for the time we wanted to order from a menu and eat and drink what we wanted. Wine. Caprese. Foot-long sausages. You get the idea. 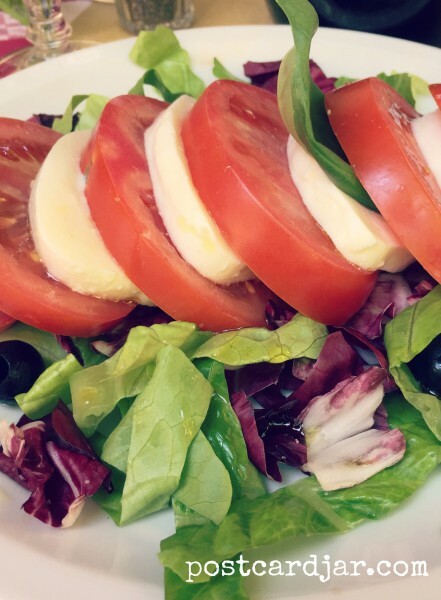 We make caprese salad all the time at home, but it tastes even better eaten with fresh mozzarella at a sidewalk cafe in the heart of Rome. 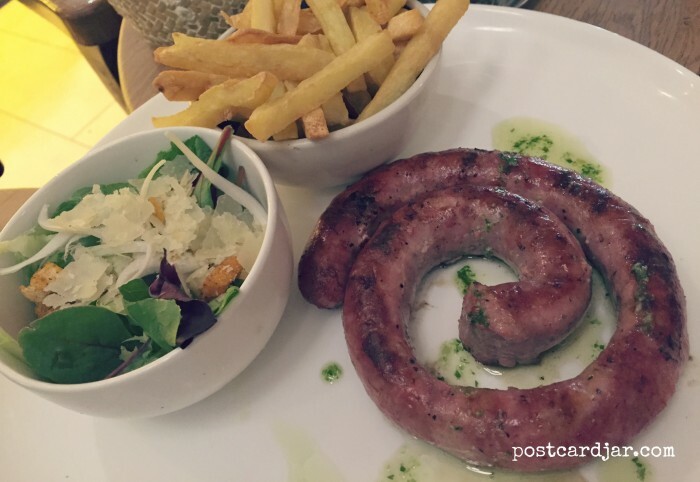 We loved the food in Spain, including this foot-long sausage rolled to perfection. A day or so later, we hopped aboard the Celebrity Equinox and cruised the Mediterranean for a week. We disembarked in Barcelona, and checked in to our hotel. After settling in, we decided we’d like a bite for lunch so headed up the block and found another sidewalk cafe. 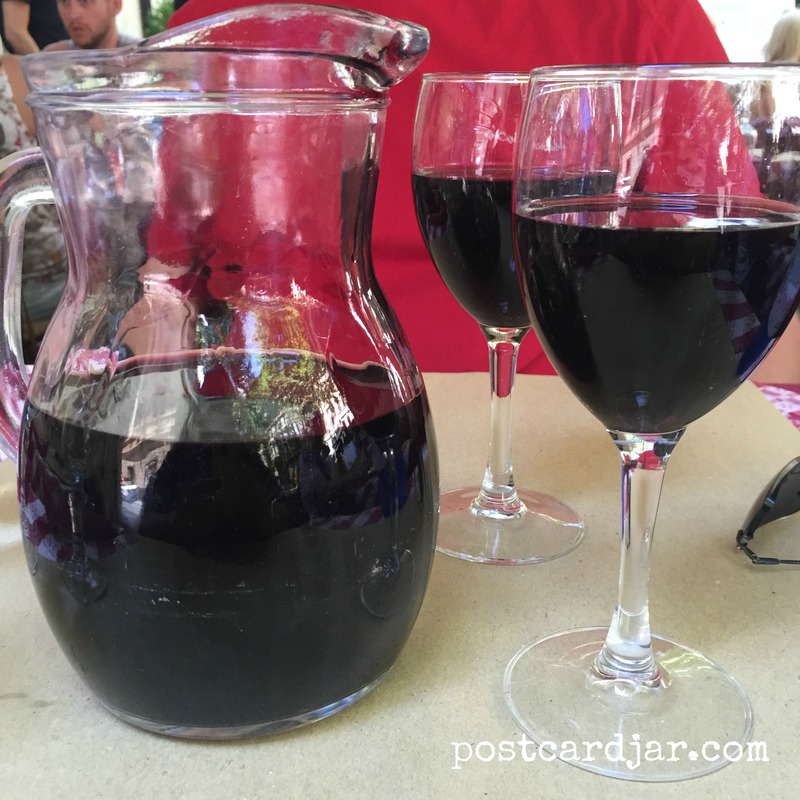 We sat, sipped wine and beer, and indulged in a delicious meal of Spanish delicacies. We liked the spot enough that we went back for dinner that night, only we ate inside this time to better escape the Spanish heat. 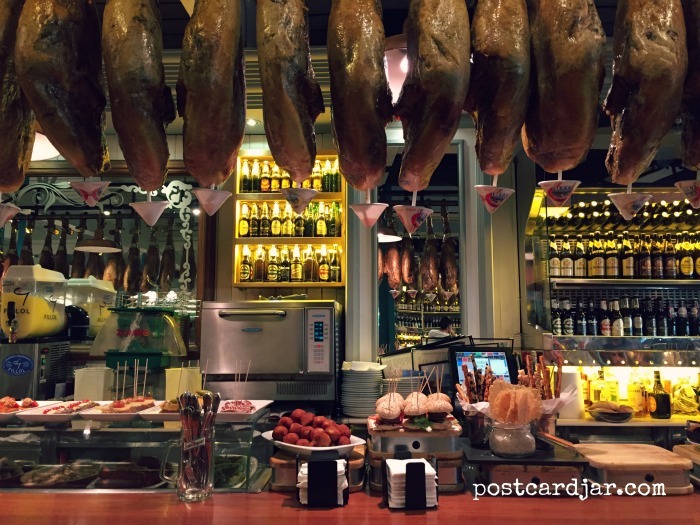 Once there, sitting among a multitude of delicious looking Spanish hams hanging over the bar, it hit us: we’d eaten in this place with students on our school-sponsored tour two years before. Who could forget these hams? Could it be true? Yes! The restrooms were in the basement as I remembered, and I even saw our downstairs table in the back corner next to them. Suddenly, my beer tasted a little better and the tapas we’d selected were a little more rich. And then karma served up the most delicious entree, yet: A tour of high school students walked in (and down the stairs). Glory day! I was so excited that I was able to enjoy a meal of my choosing without worrying about kiddos that Ann took a video of me to commemorate the occasion. Through my schadenfreude, I did feel a little sorry for the adult sponsors, and tried (unsuccessfully) to express my sympathy to them. Simply put, sidewalk cafes in Europe are all they are cracked up to be. Great food, good drinks, and a relaxing atmosphere where you aren’t pushed through your meal so the restaurant can seat the next group. I know that our future European trips will include slow, relaxing meals in sidewalk cafes–and frankly, I can’t wait.